Mele Fong remembers the exact moment she discovered the healing power of music. When she was 12 years old, Fong and four of her female cousins were in a musical group called “Charlie’s Dollies” (named after Fong’s father, who managed them). One day, the girls were asked to perform in the orthopedic ward at the Armed Services YMCA in Honolulu. As she sang and danced hula for the wounded troops, Fong says she noticed a faraway look in their eyes. 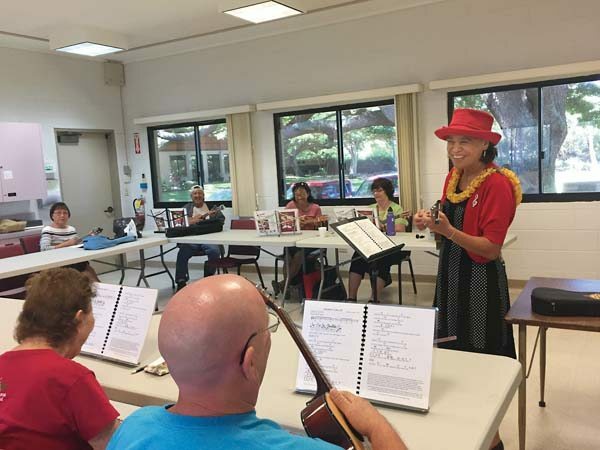 Mele Fong teaches beginning, intermediate and advanced ukulele classes for students “55 and better” at the Kaunoa Senior Center in Spreckelsville. She also leads ukulele-strumming workshops and teaches private lessons for adults and children at Hale Ho‘ike‘ike, formerly the Bailey House Museum in Wailuku. Fong started taking piano lessons at age 7 and continued to play throughout high school. “I was playing Bach and Beethoven while all of my friends were playing rock ‘n’ roll,” she laughed. After graduating from Kamehameha Schools in 1973, Fong headed to Stockton, Calif., to attend the University of the Pacific, where she earned a bachelor’s degree in recreation youth agency administration. In the years that followed, Fong wore many hats, working as a YMCA international program director, fishing guide business owner and U.S. Department of Agriculture Forest Service communications specialist in California, Washington state, Alaska and Washington, D.C.
Fong found those connections as far away as Egypt, where she performed hula, and France, where she sang with European musicians on the banks of the Seine river. And in 1996, she and her husband, Richard Tom, represented Hawaii as The Hawaiian Serenaders in a concert at the John F. Kennedy Center for the Performing Arts in Washington, D.C. “I’ve done a lot of traveling,” she said. “And I learned that my father was right: Music really is a universal language,” she said. After 27 years on the Mainland, Fong decided it was time to come home. So, in 2000, she and Tom packed their things and moved to Maui, where Fong took a job as the assistant superintendent at Haleakala National Park. Clearly, the test drive was a success — and it wasn’t long before Fong’s students suggested she take things to the next level. 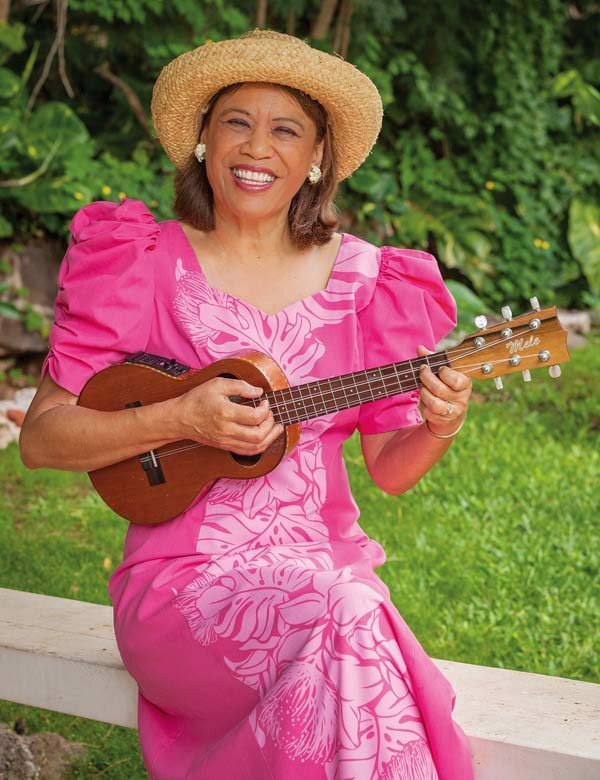 She took their advice: In 2011, she started her own business, Ukulele Mele On Maui, and began teaching virtual lessons online, as well as ukulele-strumming workshops and private lessons for adults and children at Hale Ho’ike’ike, formerly the Bailey House Museum. Fong says her method is based on the old Hawaiian way of “watch, listen and play.” “It’s the method I remember growing up as I played music with my family and friends,” she said. “And it works.” And as a Hawaiian historian, Fong also teaches her students the stories behind the songs they play. November marks Fong’s seventh year of teaching ukulele, Hawaiian history and singalong classes at the Kaunoa Senior Center and she will celebrate her anniversary Nov. 12 through 19 during Ukulele Mele Week, a weeklong series of special music classes and concerts. Fong will also perform in the ninth annual Maui Ukulele Guild Exhibition at the Queen Ka’ahumanu Center on Nov. 12, from 9:30 a.m. to 3:30 p.m.
To learn more about Ukulele Mele on Maui or Ukulele Mele Week, visit www.ukulelemeleonmaui.com or call Fong at 281-4981. * Sarah Ruppenthal is a Maui-based writer and instructor at the University of Hawaii Maui College. Do you have an interesting neighbor? Tell us about them at missruppenthal@gmail.com. Neighbors and “The State of Aloha,” written by Ben Lowenthal, alternate Fridays.